If “Social Media Extreme Makeover” was a TV series, Roper Kia would be the star. 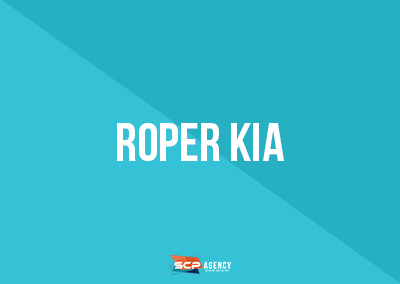 SCP Agency turned Roper Kia’s meek Facebook following into a social media stand-out–Reaching over 5,000 potential customers per day. SCP Agency worked closely with Roper Kia’s staff and provided recurring marketing training for every salesperson. Separate Facebook pages were made for sales team members to post and engage with their audience daily. In doing so, SCP Agency developed a free and effective marketing tool for the dealership through the audience of sales team Facebook pages. SCP Agency developed engaging content, weekly give-away contests, social media promotions, and community involvement that makes their social presence hard to ignore.